Primatech 1-1/2" "L" Hardwood Flooring Cleats - Floor Nailer Nails - 18 Ga. L-Shaped 6000 Ct. Product prices and availability are accurate as of 2019-04-16 23:56:16 UTC and are subject to change. Any price and availability information displayed on http://www.amazon.com/ at the time of purchase will apply to the purchase of this product. 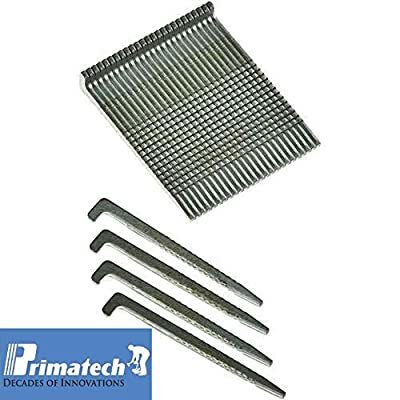 Primatech 1-1/2 Inch L-Shaped Steel cleats / nails are used for the installation of hardwood flooring and can be used in many makes of both manual and pneumatic floor nailers. Designed with collated tape, the nails hold together and waste and breakup is minimized. The sharp tips and barbed edges make allow for effective penetration and tongue split prevention, providing the correct amount of holding power. The resin coating adds subfloor retention strength and ensures the maximum hold when installing tongue and groove floors. Please note: Coverage for flooring cleats on board size, cleat spacing, and product manufacturers' recommendations. Please compute quantity of cleats necessary for the project prior to ordering.